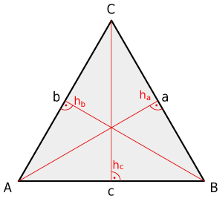 Calculations at an equilateral triangle or regular trigon. 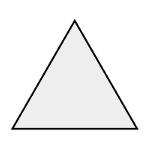 This is the most simple regular polygon (polygon with equal sides and angles). Enter one value and choose the number of decimal places. Then click Calculate. 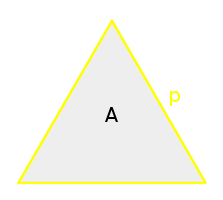 Length, height, perimeter and radius have the same unit (e.g. meter), the area has this unit squared (e.g. square meter). 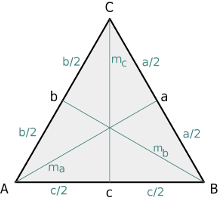 Heights, bisecting lines, median lines, perpendicular bisectors and symmetry axes coincide. 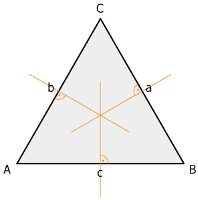 To these, the equilateral triangle is axially symmetric. 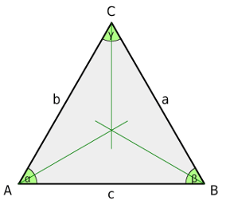 They meet with centroid, circumcircle and incircle center in one point. 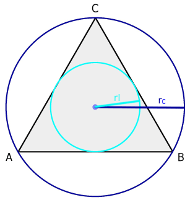 To this, the equilateral triangle is rotationally symmetric at a rotation of 120°or multiples of this.